Kiefer's Smoked Meats and Cheese was established in 1948. Paul Kiefer and his wife Frances Kiefer started a market stand at the Central Market in downtown Lancaster, Pennsylvania. Since then, Kiefer's Smoked Meats and Cheese has been family owned and operated. For the Past 60 years Kiefer's has been dedicated to bringing Lancaster County Fresh Farm Delicacies. 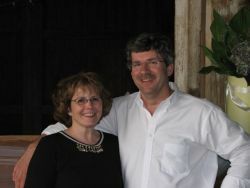 Today, Thomas Kiefer (son of Paul and Frances) and his wife Doris Kiefer are the owners of Kiefer's Smoked Meats and Cheese. Tom has added three more markets to the original Central Market stand. The four market stands are located at Central Market, Green Dragon Farmers Market, Roots Country Market, and The New Eastern Market in York County. At each stand Kiefer's offers a fine line of Hickory Smoked Meats and Cured Cheeses. Smoked Meats sold at the market stands include: Lancaster County Lebanon Bologna, Lancaster County Sweet Bologna, Hickory Smoked Ham, Hickory Smoked Bacon, Lancaster County Beef Jerky, Turkey Jerky, Cajun Jerky, Hickory Smoked Ham Hocks, Apple-Wood Bologna, Apple-Wood Bacon, Sweet Bagged Bologna, Smoked Hot Sausage, Dried Beef, Ring Bologna, and many more. Some of the Cheese Kiefer's offers include: Amish Swiss, Amish Sharp, Jarlsberg Swiss, Longhorn, Asiago, Havarti, Havarti with Dill, Farmers, Muenster, Horseradish Cheddar, Smoked Horseradish, Smoked Cheddar, Buffalo Wing Cheddar, Hot Pepper Jack, Lacy Swiss, Garden Onion, and much more! Brian Kiefer is the third generation in the family business. Brian is the General Manager of Kiefer's Smoked Meats and Cheese. He manages market stands, and is in charge of all internet sales.